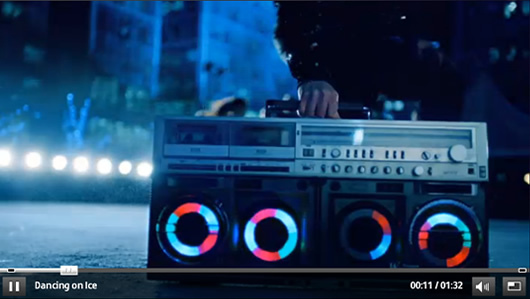 Our Sharp GF777 ghetto blaster was supplied for use in the trailer for Dancing on Ice. The coloured lights on the speakers were added in post. The original request was for the ghetto blaster used in the Madonna video which had the lights built in, but unfortunately, being an american model, there are none available to hire in the UK. So our Sharp GF-777 with a little post production magic was a good second choice!